Join us in Dubai for a family fun weekend! 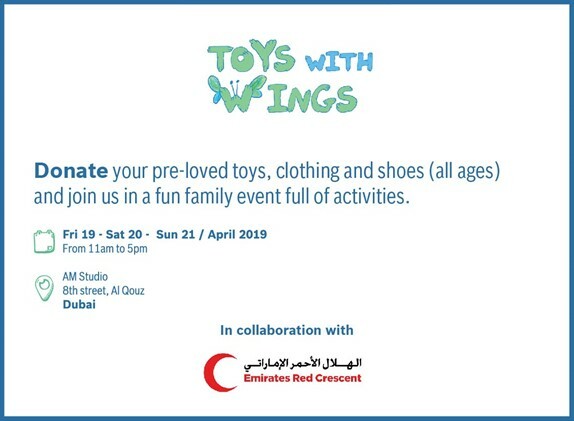 Join us by donating your pre-loved toys, clothes and shoes (all ages) in a family event full of fun activities, where your children will have the opportunity to make a difference. Bring the family and pass by any day! Enjoy free face painting, photography, art activities and more! We are Celebrating our Fourth Year Anniversary! 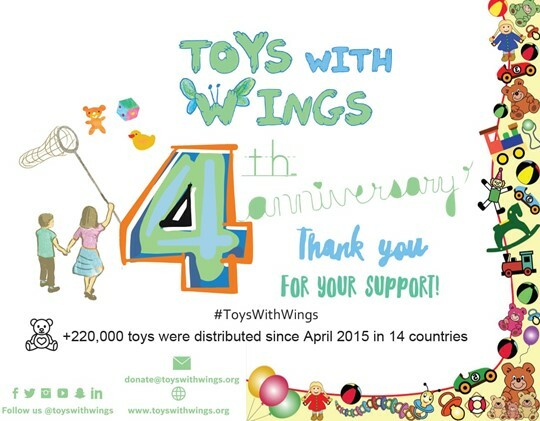 Happy 4th anniversary to Toys With Wings! More than 210,000 toys were distributed in 14 countries since our inception in 2015. We couldn't do it without you, thank you all for your support. Toys With Wings was awarded the ‘Positive Social Impact’ award at the Etisalat SMB Awards 2018. The event was held in Dubai, UAE on Tuesday, the 19th of March, 2019, and recognized initiatives, startups and companies in various fields. Amongst the nominees for the ‘Positive Social Impact’ award were; Dubai technologies, Cancer Patient Care Society, Etuix and others. Toys With Wings is honored to have received this award from Etisalat and dedicates the win to all its volunteers, supporters and partners. 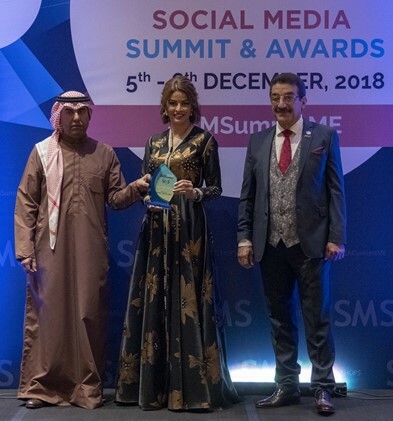 Toys With wings was awarded the ‘Best Use By Charity-Non Profit’ award at the Social Media Summit and Awards, which took place on the 5th and 6th of December 2018 in Dubai, UAE. The award was given to the founder Mouna ElHaimoud by SMS Managing Director Nasser Al Sarami. Toys With Wings is honored to have received this award from SMS Summit and Awards and dedicates the win to all its volunteers, supporters and partners. 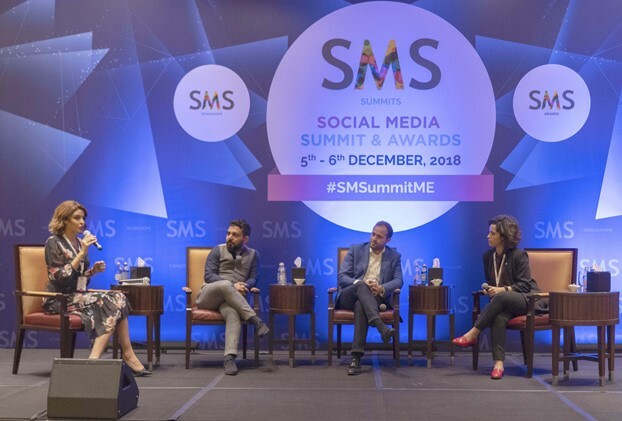 The Social Media Summit and Awards (SMS) took place on the 5th and 6th of December 2018 in Dubai, UAE, where Founder Mouna ElHaimoud, participated as a moderator in a session titled, ‘Social Media for Good: Social Media Platforms as Vehicles for Good Causes.’ Elhaimoud spoke on the topic alongside Kareem Farid, Lead Storyteller at APCO Worldwide, Raefah Makki, Assistant Engagement Campaigns Officer at UNHCR and Badih Younes, Journalist at Al Hadath News Channel & Al Arabiya News Channel. Al Yawm show on Al Hurra TV interviewed Toys With Wings founder Mouna Elhaimoud during the Social Media Summit that took place in Dubai. The topic of discussion centered around how some charities and initiatives are transparent and fulfill their cause, whilst others wrongfully use their status as a charity to obtain profits for personal benefit. During the interview, Elhaimoud spoke about ways in which individuals can avoid fraudulent charities, claiming that they are present all around us. As for the role of social media, Elhaimoud stated that it allows for the speedy spread of information and that some people take advantage of this in order to obtain money for their charity, which may often not be a trusted one. 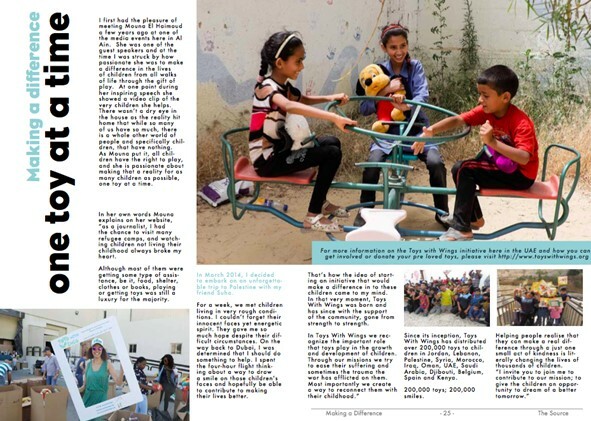 The UAE-based magazine The Source featured founder of Toys With Wings, Mouna ElHaimoud in its 176 issue, in a piece by Wendy Peach. Peach’s anecdotal introduction spoke of her first time meeting with ElHaimoud, “I was struck by how passionate she was to make a difference in the lives of children from all walks of life through the gift of play”, she says. The piece then goes on to speak about ElHaimoud’s experience at a Palestinian refugee camp and how it sparked the idea of the initiative. Toys With Wings founder, Mouna ElHaimoud was interviewed on Sabah Al Dar show in Abu Dhabi TV, to speak about the inception of Toys With Wings and its growth ever since. ElHaimoud, spoke of how the idea to create the initiative formed whilst visiting a refugee camp when she was working as a journalist. ElHaimoud believed that the kids she encountered during her visit were truly deserving of toys, considering the harsh living conditions that they encounter on a daily basis. She said that the main goal in setting up the initiative was to remain continuous in providing children in need with toys and allowing people to contribute on a regular basis. 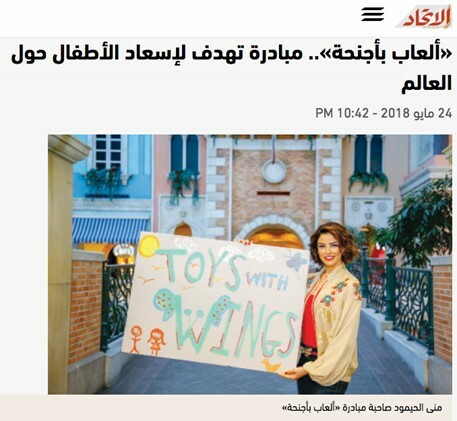 'Al Ain' News Portal details the inception of Toys with Wings and the path it has taken ever since in a video interview with Toys With Wings founder, Mouna ElHaimoud. The video kicks off by communicating the importance of toys to kids and how the initiative was able to spread toys across several countries. ElHaimoud, is featured in the short montage to speak of how a simple idea was made big with the help of volunteers, highlighting the importance of group efforts in initiatives of the same nature. In Amina Mansour’s piece titled, “Toys with wings .. Toys "flying" towards those who need them”, the author raises widely asked questions about charitable donations. “Why donate toys?” is a question frequently asked, and which Mansour has touches upon. The author stipulates that toys are essential for the sensory and intellectual development of children. Throughout the article, Mansour makes reference to Founder of Toys With Wings, Mouna ElHaimoud, with regards to her trip to Palestine as well as writing about the different features present on the website, such as the distribution map. The month-long charity campaign 'Share Your Blessings' launched by Mercato mall, in cooperation with Emirates Red Crescent and Toys With Wings received coverage from UAE-based newspaper, Emarat Al Youm. The article detailed the launch of the campaign, as well as the different ways that individuals are able to contribute to the initiative. On the matter of donating, founder of Toys With Wings, Mouna ElHaimoud, spoke of the importance of donating in order to show the younger generation the importance of giving, and views the Mercato Charity Campaign as an opportunity to do that. 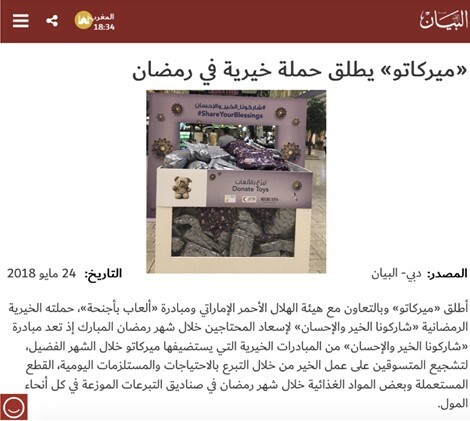 UAE-based Newspaper, Al Bayan, details the launch of the Mercato Mall Charity Campaign 'Share You Blessings'. The Campaign was scheduled for the whole month of Ramadan in partnership with Emirates Red Crescent and Toys With Wings. Al Bayan also detailed the support of The Toy Store, which offered free gift-wrapping for toys that were to be donated in the designated areas. Journalist Abdullah Al-Zaabi, from Al Ghad TV, interviewed Founder Mouna ElHaimoud on her inspiration to kick-start the initiative that happened whilst on a media trip to refugee camp in Jordan where she saw that amongst other things, the children lacked toys. 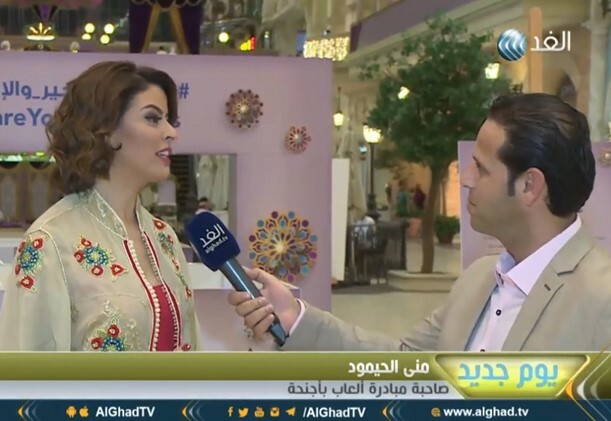 The interview took place during the Mercato mall charity campaign 'Share Your Blessings'. a month long campaign that embraced the spirit of giving during Ramadan. ElHaimoud also spoke of why she named the initiative Toys With Wings, the motive behind the logo and the first refugee camp that the initiative donated toys to. 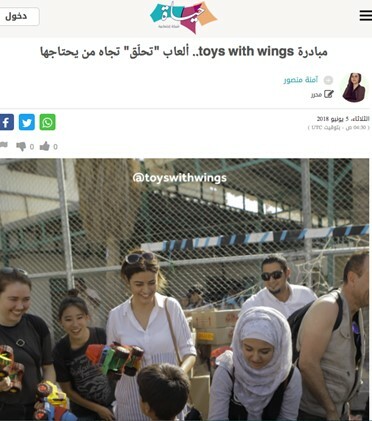 Journalist Ahmed Al Nagger, from Al-Ittihad newspaper, interviewed founder of Toys With Wings, Mouna ElHaimoud. The article kicks off by speaking about the series of events that led to the inception of Toys With Wings. Naggar makes reference to some initiatives that Toys With Wings participated in such as Mercato mall campaign, a month-long charity campaign that took place in partnership with Emirates Red Crescent. ElHaimoud concludes the interview by emphasizing that giving should not be seasonal but all year round. Toys With Wings Founder, Mouna ElHaimoud, participated at the Sharjah Government Communication Forum 2018, moderating a panel discussion hosted by the Sharjah Press Club in collaboration with the United Nations High Commissioner for Refugees. 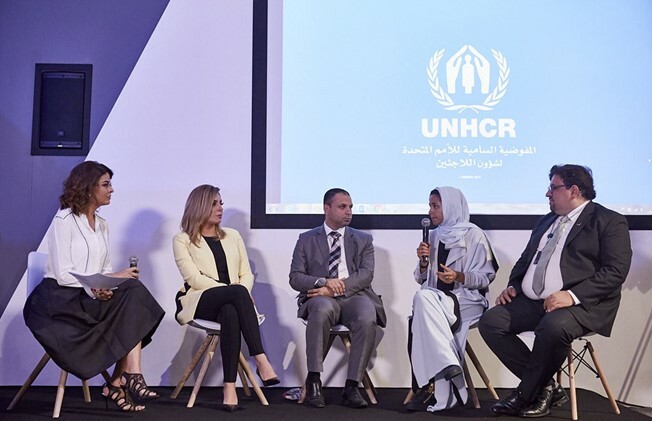 The discussion titled ‘The Role of New Media in Serving Humanitarian Causes’, hosted guests such as UNHCR Spokesperson Mohammed Abu Asaker, journalist Zeina Yazagi, Businesswoman & Social media influencer Adwa Al Dakheel, and Al Arabiya journalist Wissam Keyrouz. The panel highlighted the wide outreach of 21st century media and how it can aid in serving humanitarian issues. ElHaimoud talked about how Toys With Wings uses social media to get a wider exposure and reach more volunteers and supporters around the world. Toys With Wings have been featured in several newspapers - digital and print, in addition to TV highlights.